Chikoo, anyone? The Mexican fruit known as sapote or sopadilla was brought to India by the Spanish. ELIZABET TRAVIS is an editorial intern. CAPSULE REPORT: Kulfi, Indian ice cream, is now available in cool and refreshing ice cream bars made for American palates—richer, creamier and less grainy than traditional kulfi (they’re also made with cow’s milk instead of water buffalo’s milk). In exotic flavors like Chikoo, Faluda, Malai and Saffron, plus the more familiar Coconut, Mango, Pistachio and Strawberry, Kool Freeze Kulfi Bars are an experience in satisfying your sweet tooth, with a flair that transcends the typical frozen dessert from your grocery. The bars seem very rich, despite the fact that kulfi doesn’t have high butterfat content like premium ice cream—the bars are 160 to 180 calories. 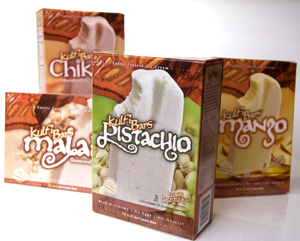 Kool Freeze Kulfi Bars are all-natural and certified kosher. On a hot day in India, one might find oneself walking down a crowded thoroughfare lined with street purveyors selling colorful sarees, bejeweled bangles and of course, street food. Among the many food vendors are the “kulfiwalla.” They supply the hot and hungry locals with kulfi, a type of ice cream that originated with the Mughal emperors (who reigned from the 16th to mid-19th century), using ice brought down from the Himalayas. It’s both a dessert and popular snack throughout southern Asia, especially on the Indian subcontinent. 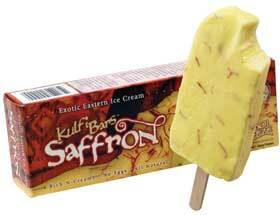 If you’ve had authentic Indian kulfi and haven’t liked it, give Kool Freeze Kulfi Bars a chance. There are two key points of difference. First, Kool Freeze Kulfi Bars use cow’s milk. In India, kulfi is most often made with milk from the water buffalo—and there’s a huge difference in flavor that makes Kool Freeze more palatable to Westerners. Second, Indian kulfi is grainier, whereas Kool Freeze is very creamy and smooth. If you need a third reason, none of the exotic flavors is particularly pronounced: These bars have a soft flavor profile. You won’t be walloped by the unknown (but even if you were, in this case, the unknown is delicious). How To Make Kulfi. Unlike Western ice creams that are whipped with air, kulfi contains no air—it is solid dense frozen milk. As such, it is not not ice cream, which requires air, or overrun, but a different category of frozen, dairy-based dessert. Kulfi is also never made with eggs, like French ice cream (see our Ice Cream Glossary for an overview of frozen desserts). It is prepared by simply boiling milk until it is reduced to half; then sugar and a teaspoon of corn syrup is added and the mixture is boiled for 10 more minutes. Water is then mixed in until it thickens into a paste, and the mixture is boiled a while longer. Then flavorings, dried fruits or cardamom are added. The mixture is cooled, put into molds and frozen. Like ice cream, kulfi is made in many flavors, with cardamom, malai, mango, pistachio and saffron being the most common (flavors influenced by the Persian civilization). How does a street vendor without a refrigerator keep the kulfi frozen in hot, hot India? Kulfiwallas placing cone-shaped molds into large earthen pots, or “matka,” filled with ice and salt. When a kulfi is ordered, they simply pull the frozen treat from its mold and serve it on a plate, garnished with pistachios, cardamom or rice noodles. Once the last kulfi is sold, the kulfiwalla returns home to prepare the next day’s batch. 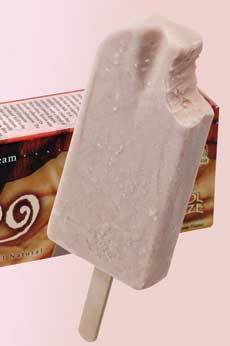 Kool Freeze has changed the typical shape of the treat from a cone to an easily recognized and enjoyed bar on a stick. They are wrapped in plastic and packaged inside boxes with delightful pictures and descriptions of what awaits inside. Made with milk, fruits, nuts, spices, organic evaporated cane juice and other all-natural ingredients, Kool Freeze Kulfi Bars are not your traditional frozen delights, but a milkier and richer bar. You can stick to familiar flavors like coconut, pistachio, mango and strawberry, or strike out into the uncharted waters of chikoo, faluda, malai and saffron. Chikoo. Also known as sapote or sopadilla, chikoo is a Mexican fruit brought to India by the Spanish. It is fuzzy on the outside like a kiwi, but has the texture of a pear. The bar has a pear’s grainy quality with an underlying sweetness reminiscent of a baked apple and pear tart. Coconut. One of the most genuine coconut bars we’ve tried. It tastes homemade, with a wonderfully frothy milk flavor and the sweet meat of shredded coconut. Faluda. Faluda, or rose, is one of the more traditional flavors of kulfi. Rose water and rose essence have been important ingredients in eastern cuisine for thousands of years, flavoring rice dishes, beverages, sweets and desserts. (In ancient Rome, rose was a popular flavoring for wines.) This bar has a nice rose essence but isn’t as floral as traditional faluda, the Persian rose and noodle sorbet (you can order a variety of spectacular rosewater ice creams and the classic Persian rosewater sorbet, faloudeh, from Mashti Malone’s Exotic Ice Creams and Sorbets). The faluda kulfi has the same fine threads of starch noodles as faluda sorbet, though we would have preferred more of them in this bar as they make the texture chewy and authentic. Malai. Malai means cream in India, and we found this flavor to be similar to vanilla ice cream—but with an icy crunch. The main taste comes from the addition of chopped almonds. It’s nice, but there is greater excitement in this line. Mango. To make this bar, Kool Freeze imports Alphonso mangoes (the “king of mangoes”), which have been cultivated in India for 4,000 years (they were brought to Europe and the Americas in the 18th century). It has a creamy classic mango flavor that is rich and satisfying. Pistachio. A good pistachio bar, with a mild and natural pistachio flavor and chopped pistachios scattered throughout. Saffron. It takes 170,000 flowers to make one kilogram of saffron strands, so the addition of saffron to a packaged dessert bar is very rare. Buttery and floral with a nice creamy contrast, the vivid red saffron strands stand in beautiful contrast to the bright yellow-colored bar. The nutty background flavor and crunchy texture of chopped almonds also helped make this bar a favorite. Strawberry. This flavor is intense, like biting into a frozen strawberry but with a smooth and milky texture. Our favorites? Saffron, because one can never have enough saffron-flavored food, especially desserts. Mango, creamy and delicious. And Coconut. But try them all and find your own favorites. If you enjoy ice cream or ice bars, you’ll most likely enjoy adding these to your freezer. There’re just a little bit different, and may well become a permanent part of your repertoire. It’s not so exotic: In fact, the creamy, mildly-flavored ice cream bars fit in nicely with everyday snacking. 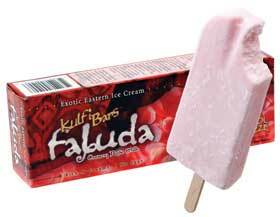 Kool Freeze kulfi bars can also be bought at some Whole Foods Markets, specialty food stores and ethnic groceries. Prices and product availability are verified at publication but are subject to change. Shipping is additional.